BALANCE PLUS Cleaner Disinfectant is a phosphate free concentrated cleaner disinfectant which provides effective cleaning, deodorizing, disinfection and sanitization for use in schools, nursing homes, hospitals, food processing plants and other institutions. When used as directed, BALANCE PLUS is an effective cleaner, disinfectant, sanitizer, deodorizer, fungicide, mildewstat and is effective against Hepatitis C, Influenza A2/Asia, Herpes simplex Type 1, Adenovirus Type 2, Vaccinia virus, Feline calicivirus/Norwalk virus and Avian Influenza virus, Type A (Turkey/wis/66), H9N2 and HIV-1 (Human Immunodeficiency Virus). 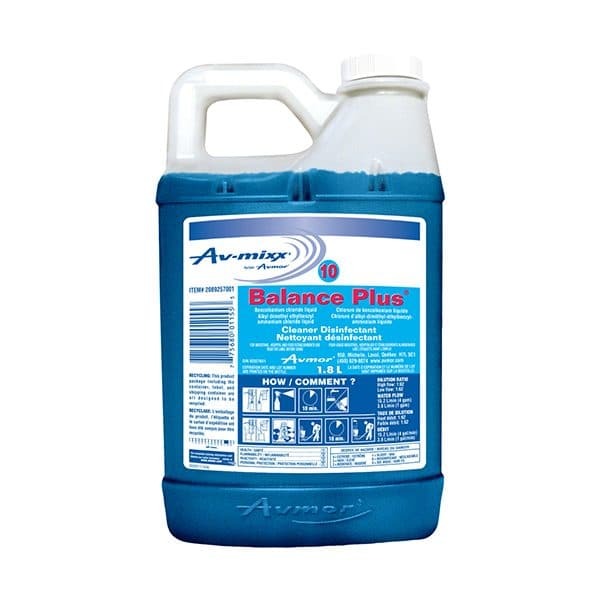 BALANCE PLUS is effective on walls, floors, sink tops, tables, chairs, garbage cans, telephones, bed frames and other hard, non-porous surfaces. APPLICATION: Remove gross filth and heavy soil deposits. A pre-cleaning step is required and recommended for heavy soiled areas. DISINFECTION: PRE-CLEANED HARD SURFACES: Use 16 ml of BALANCE PLUS per litre of water (1:62). Apply solution with mop, cloth or sponge to wet thoroughly. Allow treated surfaces to remain wet for 10 minutes and then let air dry. Prepare a fresh solution for each use. When using on food contact surfaces, rinse with potable water after disinfection. DO NOT MIX WITH OTHER CLEANERS. At this dilution, BALANCE PLUS is an effective disinfectant against the following: Pseudomonas aeruginosa PRD-10, Escherichia coli, Klebsiella pneumoniae, Salmonella schottmuelleri, Salmonella choleraesuis, Streptococcus salivarius, Methicillin resistant Staphylococcus aureus (MRSA), Vancomycin resistant Staphylococcus aureus (VRSA), Brevibacterium ammoniagenes, Streptococcus faecalis, Shigella dysenteriae, Enterobacter aerogenes, Staphylococcus aureus, Streptococcus Pyogenes. FUNGICIDAL ACTIVITY: BALANCE PLUS is also effective against Pathogenic fungi, Trichophyton mentagrophytes. VIRUSES: BALANCE PLUS is effective against Hepatitis C, Influenza A2/Asia, Herpes simplex Type 1, Adenovirus Type 2, Vaccinia virus, Feline calicivirus/Norwalk virus and Avian Influenza virus, Type A (Turkey/wis/66), H9N2. For HIV-1 (Human Immunodeficiency Virus): Use 16 ml of BALANCE PLUS per litre of water, to clean and decontaminate hard surfaces exposed to blood or other body fluids that contain the HIV-1 virus. Clean blood or body fluids from surfaces before applying BALANCE PLUS. Treated surfaces must remain wet for 10 minutes. Personnel that clean items soiled with blood or body fluids should be cautioned to wear protective clothing including latex gloves, smock, mask and eye goggles. Cleaning materials and clothing soiled with blood or body fluids should be autoclaved and disposed of according to local regulations. Prepare a fresh solution for each use. SANITIZATION: To sanitize non-porous food contact surfaces; prepare 200 ppm active quaternary solution by diluting 4.44 ml of BALANCE PLUS per litre of water (1:225). To sanitize surfaces such as tanks, cutting boards, counter tops, flood the area with 200 ppm BALANCE PLUS solution allowing the area to remain wet for at least 60 seconds (1 minute) and let air dry. Solution can be applied with sponge or cloth. Prepare a fresh solution for each use. To sanitize items, such as drinking glasses and eating utensils, immerse in 200 ppm BALANCE PLUS solution for at least 60 seconds (1 minute). Remove from solution and let air dry. Prepare a fresh solution daily or more frequently. MILDEW: To control mold and mildew on pre-cleaned, hard non-porous surfaces such as floors, walls, tables, add 16 ml of BALANCE PLUS per litre of water (1:62). Apply solution with mop, cloth or sponge making sure to wet the area thoroughly. Let air dry. Prepare a fresh solution for each use. Repeat application at weekly intervals or when mildew growth appears.